Toll free number lines are still widely used by both big and small businesses. You may be wondering if toll free lines are still important for businesses, and the answer is yes. Getting a toll free line for your small business not only makes it easy for customers to call you, it gives your business a more professional appeal. However, even more importantly, having a toll free number ensures your business owns its phone numbers. 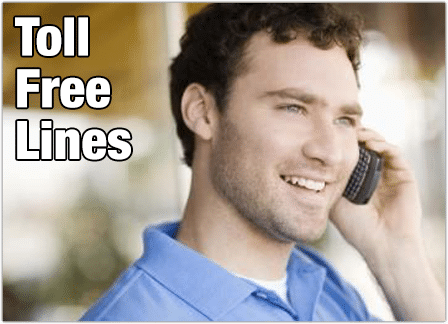 Toll free lines are the only telephone numbers protected by FCC porting regulations via authorize toll free number providers known as RespOrgs (aka Responsible Organizations). Toll free lines are not just for Fortune 500 companies with call centers, small business may even benefit more from having a 1800 number toll free line. That’s because small businesses often change location and phone company providers. Only 800 numbers make it easy to take your business phone number with you wherever you go. Plus the added credibility of having a toll free 1-800 number doesn’t hurt! 1. Don’t get toll free lines and 800 numbers from a large phone company like AT&T because you’ll pay too much. 2. Decide what toll free features you need, voicemail, call toll free forwarding to multiple extensions, etc. 3. Check out the virtual office phone system from UniTel Voice – it includes a toll free number loaded with features at a low on price.